OK, so that last one might be reserved for the likes of JK Rowling and other big hitters. Still, it's worth remembering that every successful author was once a first-time writer also, right? For each and every one of these major milestones, I could easily devote and entire book. Indeed many people have already done exactly that. There are also lots of various intermediary steps but the above list is essentially the broad strokes of what you need to get yourself going as a successfully published novelist. For this article, however, I'm going to focus just on of these milestones: book formatting considerations. Who will do the book formatting? If you are a traditionally published author, chances are that someone else do the book formatting on your behalf. In fact, you may not have much say at all in the entire process even if you wanted to. This is one of the benefits (or disadvantages - depending on your perspective) of being traditionally published. You can either view this as a lack of burden or a lack of control - I'll let you be the judge. If you are an indie author, on the other hand, this is very much a choice you will have to make. For indie authors, this decision is very often driven by costs. You can save money by doing your book formatting yourself or you can pay spend money and farm the work out to a professional. This is by no means an exhaustive list. Some of these tools have steep learning curves, which can be off-putting for some people. Others are easier to use but might lack a degree of flexibility or have limited features. There’s no right or wrong answer as to which one you should choose. Whatever gets the job done. In addition to the above desktop tools, there are a range of others utilities for doing things like converting from one file format to another, including various online resources. Regardless of the tools of the trade you choose to format your book with, there are a number of basic things you need to consider when it comes to the book formatting process. If you plan to create a physical book, then the Print On Demand (POD) company that you use will want you to provide your manuscript in PDF format. For eBooks, it's going to be either a MOBI file format for distribution on Amazon, or an ePub file format for distribution pretty much everywhere else. You’ll therefore need to consider which file formats you need to produce when deciding which tools to use for formatting your book. If you are creating a paperback or hardback version of your book, you'll have to concern yourself with various things that directly relate to how and where the content is physically printed on the page. It isn't just a matter of producing your text and then clicking the publish button. There's a whole range of personal preferences and a wide degree of choice involved in deciding what your book will look like. After all, have you ever seen two books that look exactly the same? Next, we’ll discuss some of the things that you, or your book formatter of choice, will need to consider when it comes to formatting your physical print book. Call to action – buy my next book! The section sandwiched in between the front matter and the back matter are the pages of your actual novel. All three of these sections represent the content that will be included on the inside of the book. Next comes the task of deciding what it all needs to look like. 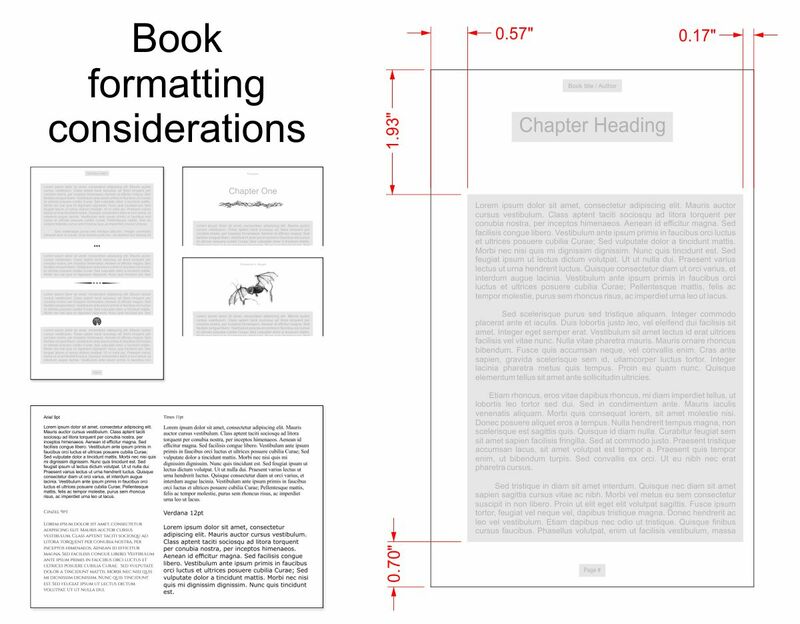 Some aspects of the book’s layout will just affect its aesthetics but others will directly impact on the total number of pages, and that can have an impact in the overall cost of production. The more pages, the more your Print On Demand (POD) vendor will charge you to produce each book. There are countless combinations of how wide and tall different books can be. The bigger the book, the fewer pages are needed. Some POD vendors will provide you with a list of different size combination to choose from, so that will need to be considered up front. 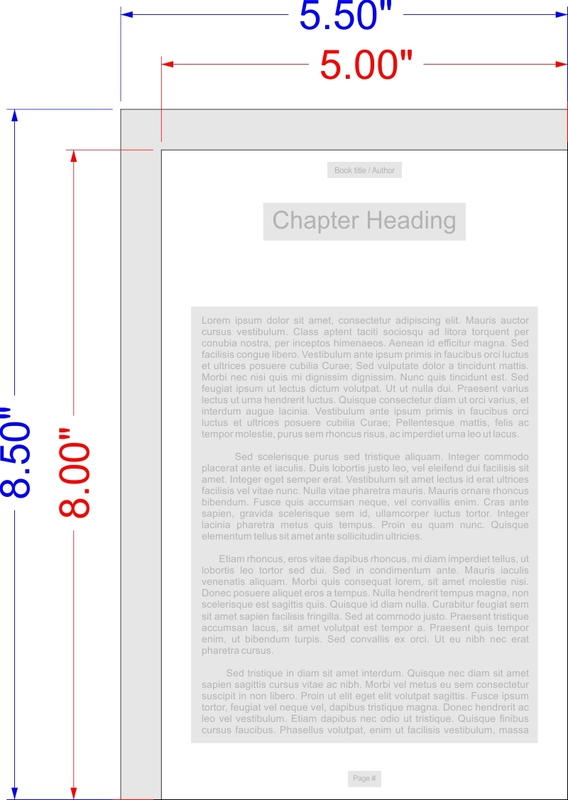 You don’t want to get your book just right and then find you have to change the page dimensions. Will you use a serif or sans-serif font? How big do you want the typeface to be printed? When choosing your font, you'll need to consider readability and what’s comfortable for the reader. 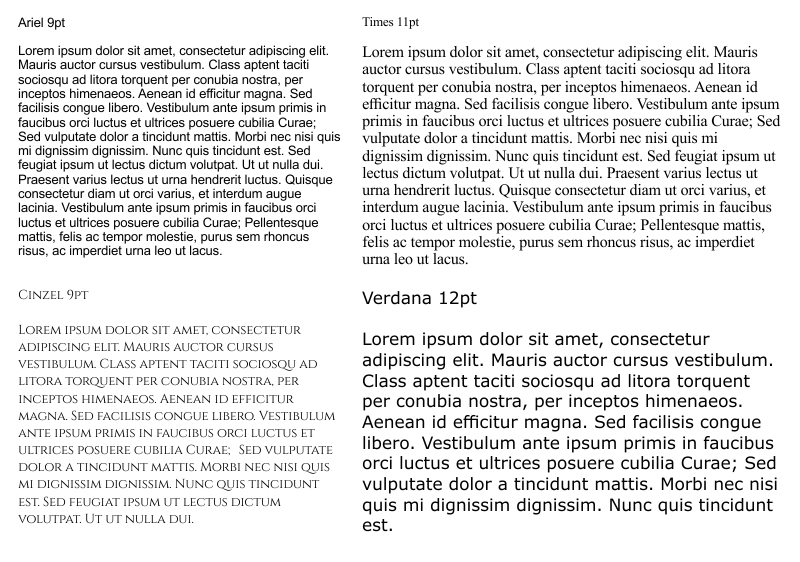 It’s also necessary to consider what it looks like if anything is printed bold, italics, UPPER CASE, small caps, etc. More space between the lines of text on the page often makes for a more comfortable reading experience. By default, most text processing programs start off with single line spacing, which is what you are reading now. The spaces between the lines can be incremented by very small increments. It can be quite subjective as to what’s right for your book. Very long novels tend to have very narrow spaces between the lines in an attempt to reduce the number of pages for cost reasons. How far from the four edges of the page do you want your text to appear? 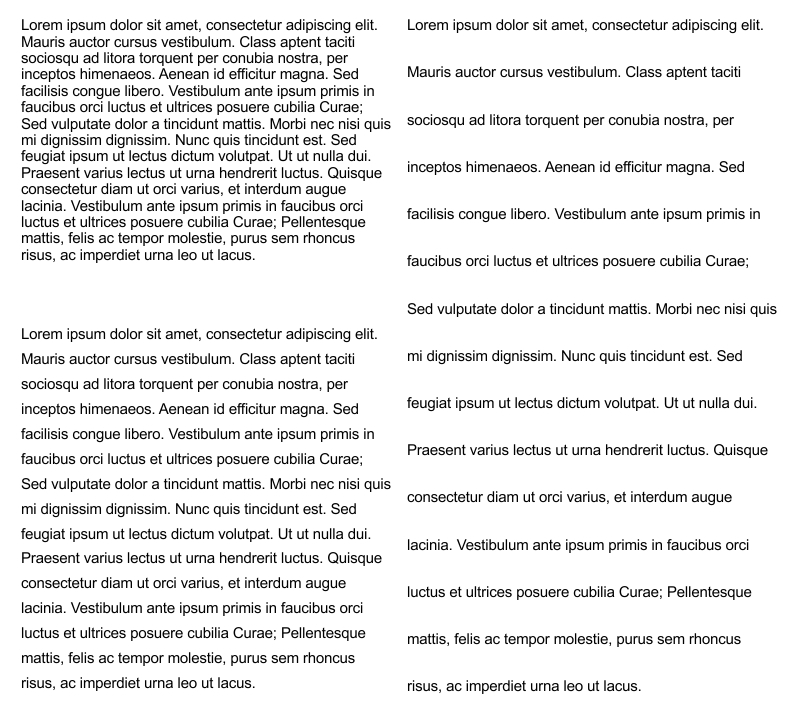 Also, you may want to print the text on left-hand pages shifted closer to the left edge of the page and the text on right-hand pages shifted closer to the right edge of the page. Doing this increases the gutter space, so that you don't have to flatten the book open quite so much to see the text closest to the center where the pages join. It’s important to consider any requirements your POD vendor might have. Some have limitations on how close to the edge you’re allowed, which can also be determined by the length of the book. 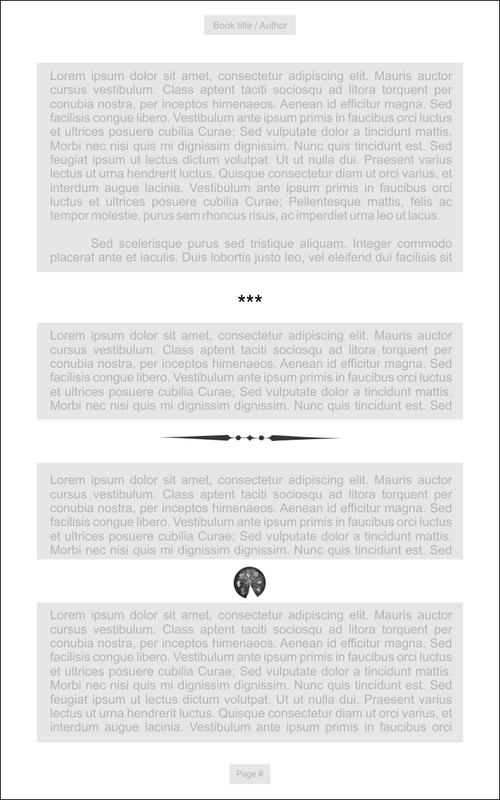 You could choose a different typeface for both the headers and footers. It could be printed on the outside, inside or center of the page. You might also have different header information on alternative pages. For example, you could have the author name in the left-hand header and the book title in the right-hand header, etc. Page numbers, if you want them at all, typically go into the footer but, again, you could print them on the outside or center of the footer (page numbers on the inside of the page will make it harder to find a given page number when flipping through). You could have the generic words like Chapter One, Chapter Two, etc., as chapter titles and there’s nothing wrong with this. You might instead, however, have specific titles of your own choosing. Or, you could have a combination of both. Then you need to consider whether the chapter title appears at the top of the page, directly beneath the header, or some way down the page, leaving some blank space. 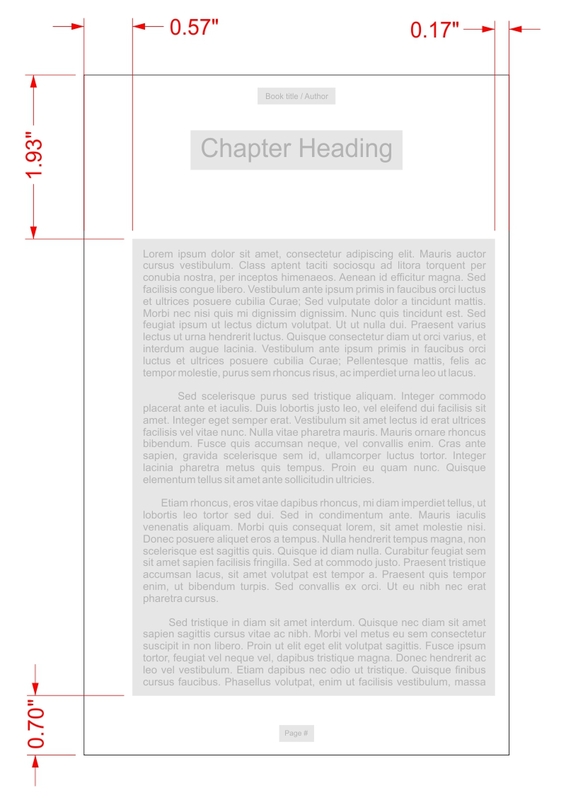 Similarly, you need to decide how much space to leave between the chapter title and the text on the page. 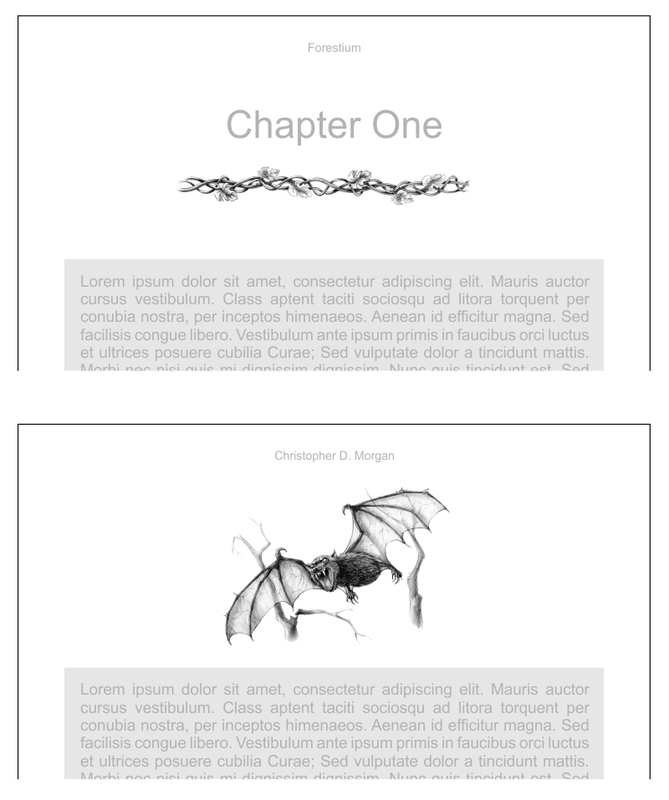 Another option is images or illustrations at the start of each chapter. Speaking of images, you could include images, tables or anything else alongside the text of your story. A well-placed image can accentuate your writing and give your book a classy feel. It also makes it more interesting to the reader. If you have scene breaks in your writing, you may want to include some scene separators. The convention is to use a small grouping of asterisks, like ***, but you might want to consider using a small graphic instead, etc. Feeling daunted? At the end of the day, whether you or someone else is doing the book formatting, the book formatter will be making decisions about all these things. For eBooks, things are, fortunately, quite a bit simpler in that there are fewer physical layout issues you need to worry about. This is because eReaders have the ability to change how the content is displayed on the page anyway, based on reader preference. With a physical book, a page will have a definitive number of words and that number is based on things like physical page size, size of the font, margins sizes, line spacing, etc. 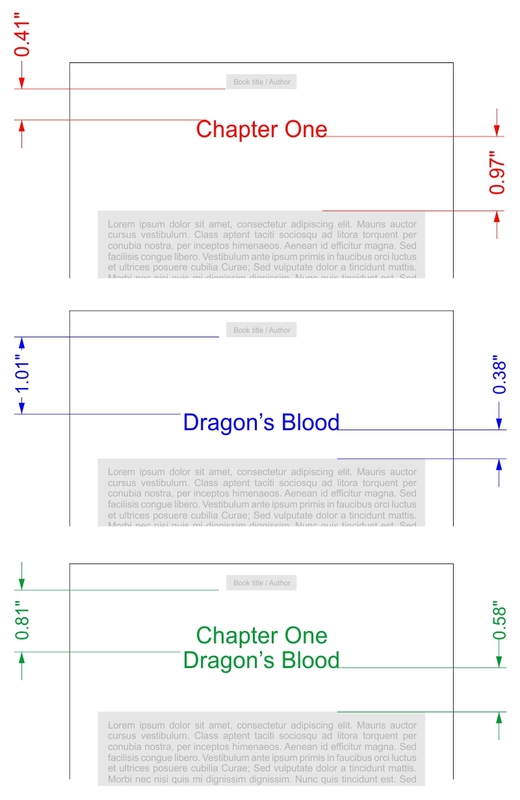 With an eReader, the number of words displayed is controlled by the size of the screen or display window and how big or small the reader wants the text to appear. As such, although you still control the content, like front matter, back matter and chapter contents, there's little else you need to worry about. So, when the time comes for you to produce your manuscript into a format that's print or eBook publication ready, you'll have a better idea of what you need to do to reach that milestone. If, like the vast majority of people, it all seems a bit too much to handle, or you simply don't want to do it yourself for whatever reason, just drop us a line here at Dragon Realm Press and we'll be happy to help.